Women's underwear, Costume Parisians (Paris) 1822. The model wears a chemise pleated in back and a boneless corset that laces in the front. Costume Parisians, 1808-9, "Hair in braids, Corset a la Ninon." 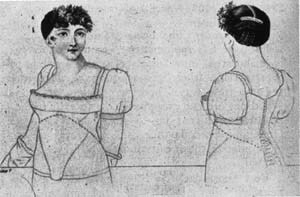 This corset laces in back is and much more "structural," clearly attempting to increase the bust and draw in the waist. Unlike Victorian corsets, this one doesn't seem focused on drawing in the natural waist, an unnecessary feature when fashions have the waist under the bust. Notice that no effort is made to move the breasts together--the two breasts very separated was fashionable. 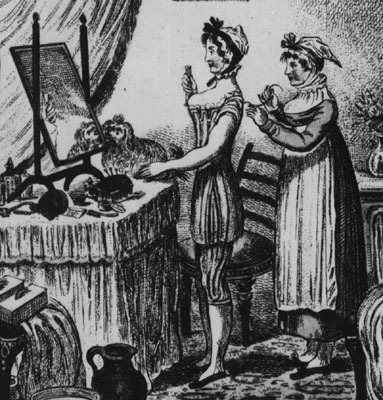 Later corsets that even more clearly divide the breasts were called "divorce corsets."